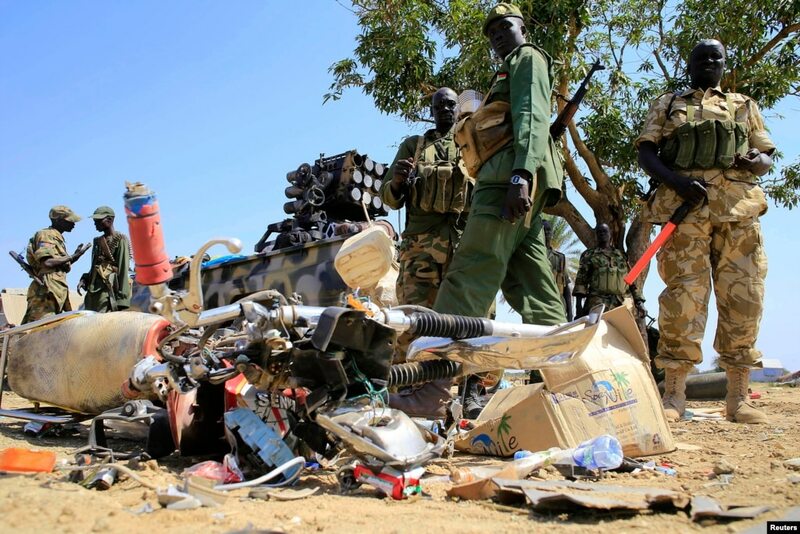 FILE – South Sudan army soldiers stand next to a destroyed motorcycle near Bor Airport, northwest of capital Juba, Dec. 25, 2013. Fresh fighting has broken out in South Sudan’s key city of Bor, which the country’s army reclaimed from rebels last week.The clashes Tuesday follow renewed calls by the United Nations and African Union for an immediate end to the violence. Statements from the U.N. Security Council and the A.U.’s Peace and Security Council late Monday said dialogue should begin immediately between President Salva Kiir and rebel leader Riek Machar. Museveni is playing the regional “daddy” role. Lets not forget how he came to power in 1986.In the the insert Museveni is being sworn in as president on 26 January 1986 after overthrowing Idi Amini. The African Union also urged Kiir’s government to release detained political leaders, and threatened to impose sanctions on those who continue to incite violence. The East African bloc IGAD set a Tuesday deadline for the two sides to hold face-to-face negotiations, but there has been no indication that the deadline will be met. Ugandan President Yoweri Museveni visited Kiir on Monday, and warned Machar to sign a cease-fire deal or face action from its neighbors. Fresh fighting in Jonglei has raised new fears of the clashes engulfing the whole of South Sudan. The IGAD statement last week did not include a threat of force, but said the group would “consider taking further measures” if fighting continued. 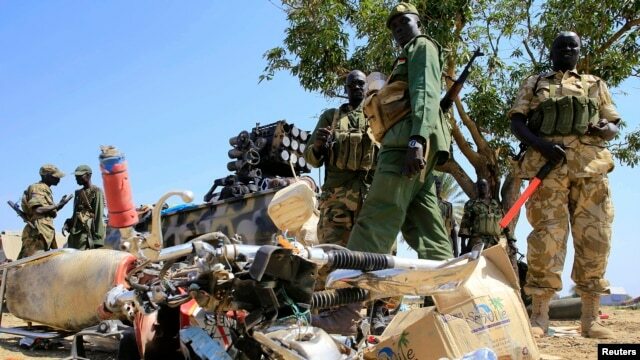 Meanwhile, officials say soldiers battled rebels Tuesday in Bor, the flashpoint capital of Jonglei state, a week after the government said the army had retaken control of the city from rebel fighters. A spokesman for the U.N. mission in South Sudan told VOA on Monday that the United Nations was extremely concerned about reports of large numbers of armed youth advancing toward Bor. The spokesman said the reported advance in the general direction of Bor of the group was a very troubling development. Armed youths of various ethnic backgrounds in Jonglei state have been at the center of much of the intercommunal fighting that has plagued South Sudan since the country became independent 2.5 years ago. White Army youths are known for the white powder they use to cover their skin as an insect repellant. Like Machar, they are ethnic Nuers. President Kiir and his loyalists are ethnic Dinka. The tribal violence erupted earlier this month, when the president accused Machar of attempting a coup. The United Nations says the fighting has left more than 1,000 people dead and displaced tens of thousands. Posted on 31st December 2013 by newsafrica. This entry was posted in Africa, African Security, Democracy, Leadership, Paul Kagame, Rwanda, South Sudan, Sudan (North), Tanzania, Uganda, Uhuru Kenyatta, Yoweri Museveni. Bookmark the permalink.